The What: BenQ America Corp. has a new P Series line of professional installation projectors. Designed to bring performance to commercial applications in education, retail, and corporate environments, the company's new projector family provides XGA and WXGA resolutions, up to 6,500 lumens of brightness, and flexible setup options for switchable color wheels and optional lenses — all at a reasonable price point. Why This Matters: "Our new line of P Series projectors was engineered to provide the marketplace with a more affordable package for producing professional-grade projection within a wide range of settings," said Kristin Kennedy, Associate Vice President, Sales at BenQ America Corp. "Built with high-brightness capabilities, easy control options, and the ability to customize the projector's components to satisfy specific applications, our P Series is BenQ's latest value-centric innovation made to bridge the needs of customers with a cost-effective solution coupled with powerful features." The What Else: Consisting of the PX9600 and PW9500, the P Series' respective XGA and WXGA models deliver high brightness of 6,500 and 5,700 lumens as well as crisp 2800:1 contrast ratios — enabling Colorific picture-perfect clarity in any lighting scenario or installation environment for accurate and long-lasting color reproduction. Equipped with HQV image processing, the technology allows the devices to scale outputs, enabling the projectors to cast full resolutions that enhance both image details and overall picture quality. The feature also reduces the mosquito effect and blocks the random noise often associated with compressed digital videos formats. One More Thing: Total flexibility is also facilitated by the P Series' 360-degree projection capabilities — bringing multiscreen functionality to applications such as retail floors, galleries, and theater applications. With LAN control, the PX9600 and PW9500 enable control and monitoring over a single LAN cable, allowing IT managers to remotely manage and maintain devices directly from workstations. Both devices also feature PJLink compatibility and provide DVI and 5BNC connectivity points. 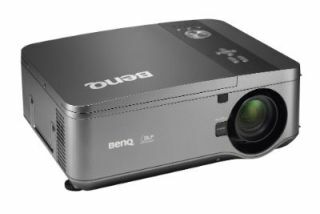 BenQ's PX9600 and PW9500 P Series projectors are now available.